January 27, 2015 By Allyson 3 Comments This post may contain affiliate links. Read my disclosure policy. Over the last few weeks I have been brainstorming about what to make for the big game coming up in a few weeks. 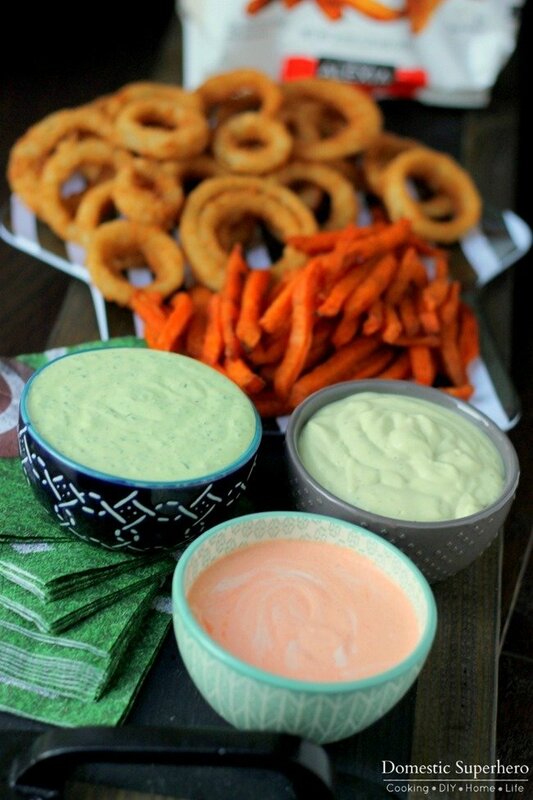 We love dips at our house, as well as Alexia fries and Onion Rings. 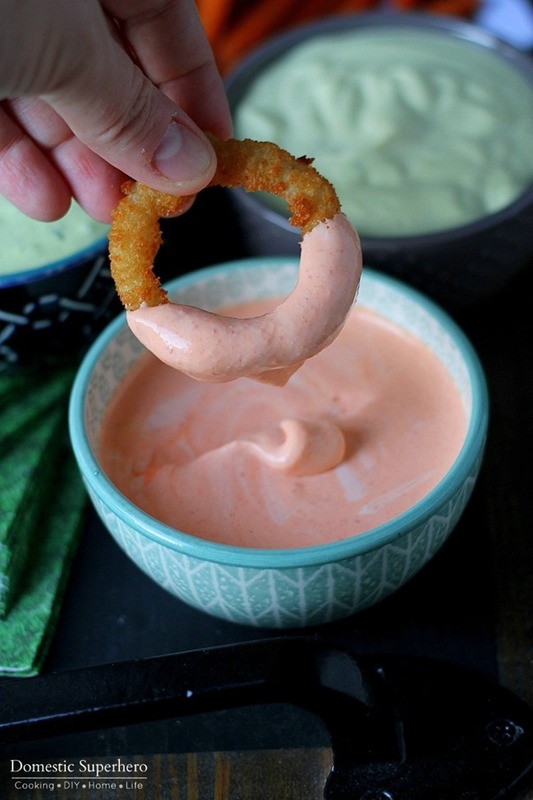 I wanted a little variety, so I decided to ship up 3 different dips, a trio if you will, to pair deliciously with the Alexia Chipotle Sweet Potato Fries (so yum) and the Crispy Onion Rings. The dips are really easy to throw together, and don’t take many ingredients, which make cooking on game day a lot less stressful. 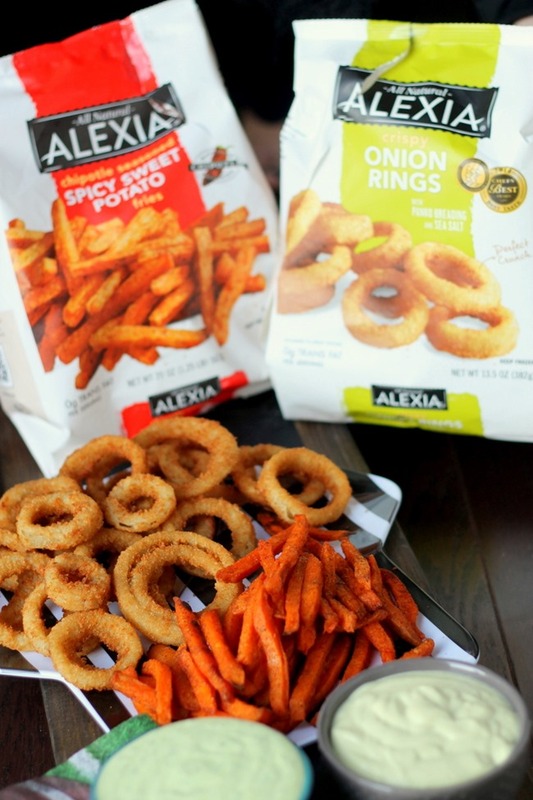 I always head to Walmart to pick up Game Day snacks, including Alexia products. 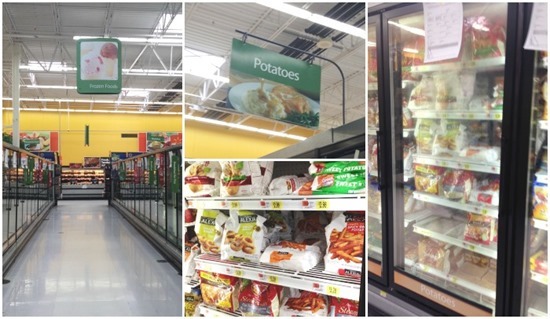 You can find them in the frozen foods section, by the other potatoes. I especially love their onions rings because they are baked and delicious. After baking them, they turn out so crispy and tasty, perfect for dipping. I whipped up the Avocado Ranch for my husband, because he LOVES avocados and ranch. I love avocados, but 4 years ago my body decided it didn’t like them and now I am deathly allergic…weird, right? 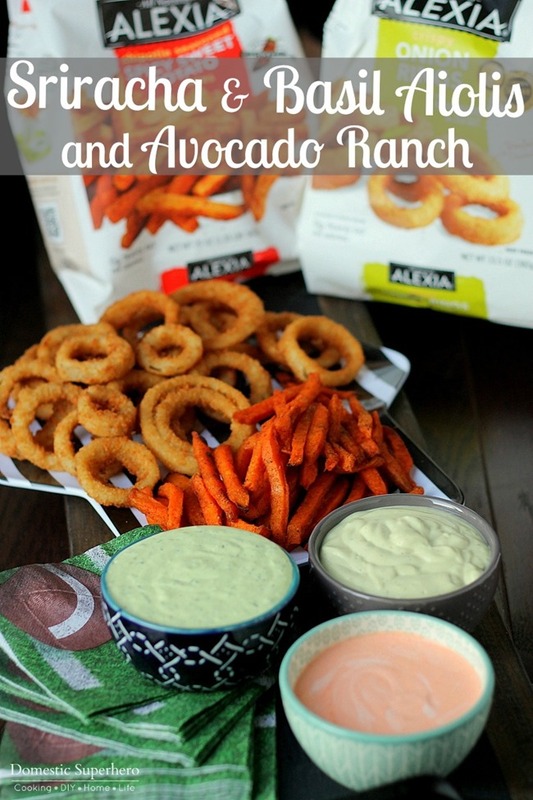 Anyway, my husband said he loved the way the creamy avocado ranch balanced the spicy chipotle sweet potato fries. Perfect combo! Then I decided to make a creamy spicy sriracha aioli. I lightened it up a bit by using greek yogurt instead of all mayo. This is a spicy one, but if you like less spice, you can just use less sriracha! It was SO good with the crispy onion rings! Lastly I made a cool and creamy basil aioli. I absolutely love fresh basil, and blending it together to make an aioli was perfect! It paired well with both the onion rings and the spicy chipotle sweet potato fries. 1. In the bowl of a food processor add avocado, Greek yogurt and milk; mix for 30 seconds. Then add lemon juice, vinegar, garlic, parsley, and salt; mix for 30 seconds or until well combined. Scrape down the sides and then mix again for a few seconds. 2. Store in an air tight container in the fridge for 30 minutes before serving. 1. In a small bowl mix all ingredients with a whisk or fork. Add salt and pepper to taste. 2. Refrigerate for 30 minutes before serving. 1. In a small sauce pot, fill halfway with water and bring to a rolling boil. Dip basil leaves into the water to blanch, for 15 seconds each. ** Place leaves on a few layers of paper towels, and squeeze to dry out the water. 2. In a food processor bowl, add all the ingredients, and process for 30 seconds or until everything is well combines. Scrape down the side and mix for 30 more seconds. 3. Refrigerate for 30 minutes to meld the flavors. Serve. 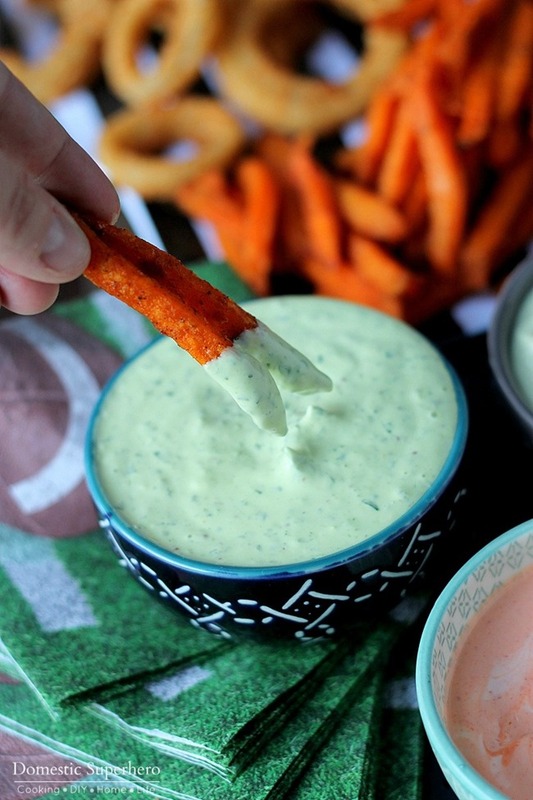 I can’t wait to bring these dips to the big game party in a few weeks! I know all my friends are going to LOVE them! Love Alexia products as much as I do? 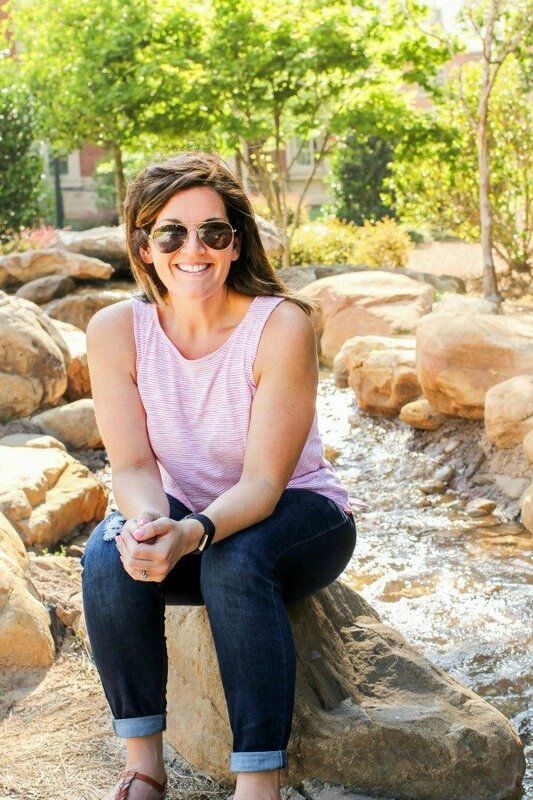 Then check them out on Facebook and Pinterest! What is your favorite game day food? Is there something you can’t live without while watching football? 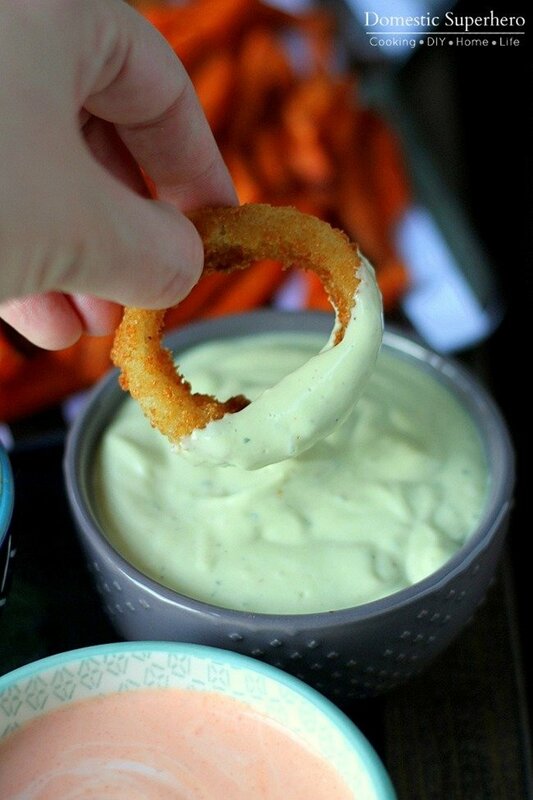 I’ll take the onion rings with all three dips! Those sound good. It is time to go home and make dinner.